It is 60 miles from Lyme Regis to Christchurch and 39 miles from Shaftesbury to Weymouth. Bournemouth International Centre, Exeter Road, Bournemouth, BH2 5BH. Telephone: 01202 456400. The Bournemouth International Centre (BIC) is one of the most prestigious venues for conferences, exhibitions, entertainment and events. From Birthday Parties to Party Political Conferences, Amateur Musicals to top Rock and Pop Concerts. 17disabled parking spaces. www.bic.co.uk. Location: In the centre of Bournemouth. Pavilion Theatre, Westover Road, Bournemouth, BH1 2BU. Telephone: 01202 456400. The International Centre, the Pavilion Theatre and the Pier Theatre are venues for shows, plays, ballet, opera, banquets, civic functions, wrestling, ballroom dancing, conferences, exhibitions and more. Wheelchair access is possible to the majority of public areas within the Pavilion - with the exception of the Snug Bar, Committee Room, Circle and Circle Bar. www.bic.co.uk. Location: In the centre of Bournemouth. Oceanarium, Pier Approach, West Beach, Bournemouth, BH2 5AA. Tel: 01202 311 993. The Oceanarium Bournemouth brings you face to face with marine life from the furthest reaches of the globe. Plasma screen documentaries, walk-through underwater tunnel and exhibits and more. www.oceanarium.co.uk. Location: In the centre of Bournemouth. The Russell-Cotes Art Gallery and Museum, East Cliff, Bournemouth, BH1 3AA. Tel: 01202 451858. The Museum Shop sells a selection of books, cards and gifts. Cafe. Most of the building is wheelchair accessible. Exhibitions include Japanese metalwork. www.russell-cotes.bournemouth.gov.uk. Location: In the centre of Bournemouth. Wimborne Minster, High Street, Wimborne, Dorset, BH21 1HT, Tel: 01202 884753. For over 1300 years this Wimborne Minster has been a centre for pilgrimage, prayer and worship. Visit the Minster and you will be warmly welcomed. In the summer Guides and 'Ministry of Welcome' are on duty. www.wimborneminster.org.uk. About 5 miles north of Bournemouth. Highcliffe Castle, Rothesay Drive, Highcliffe, Dorset BH23 4LE. Tel: 01425 278807. Highcliffe Castle is a Grade I listed building which was built between 1831 and 1835. The castle is open daily from 1st February- 23rd December. Inside the Castle there are 5 partially restored staterooms housing a gift shop, visitor centre and galleries featuring a changing programme of exhibitions. Guided tours. www.highcliffecastle.co.uk. Location: In the centre of Christchurch. Sammy Miller Motorcycles, Bashley Cross Rd, New Milton, Hampshire, BH25 5HZ, TEL: 01425 616446. The museum houses the finest collection of fully restored motorcycles in Europe, including factory racers and exotic prototypes, plus memorabilia spanning 7 decades. There are over 300 rare and classic motorcycles on display in four galleries. www.sammymiller.co.uk. About 1 mile east of Christchurch. Christchurch Castle and Norman House. The remains of Christchurch Castle include parts of the mound-top keep, and more unusually the 12th-century riverside chamber block or 'Constable's House'. This very early example of domestic architecture includes a rare Norman chimney. English Heritage. Located in Christchurch, near the Priory . Nothe Fort, Weymouth, Dorset, DT4 8UF. The fort was built in 1860 to protect Portland's harbour, which was then becoming an important Royal Navy base. The fort played an important role in World War II, when the harbour was used by the British and Americans. www.fortressweymouth.co.uk. Location: About 7 miles south of Dorchester. Brewer's Quay, Weymouth. Tel: 01305 777622. Re-developed Victorian Brewery, in the Old Harbour now housing the award winning Time Walk and indoor Shopping Village. Admission charges apply to the Time Walk Museum. Location: About 7 miles south of Dorchester. Jordan Hill Roman Temple, Weymouth. The foundations of a 4th-century Romano-Celtic temple. English-Heritage. Location: About 7 miles south of Dorchester. Hardy's Cottage, Higher Bockhampton, nr Dorchester, Dorset DT2 8QJ. Tel: 01305 262366 (Custodian). Birthplace of novelist and poet Thomas Hardy. National Trust. Charges apply. About 2 miles east of Dorchester. The Tutankhamun Exhibition, Dorchester, Dorset. A spectacular re-creation of Tutankhamun's tomb and treasures. The current exhibition of Tutankhamun follows the Treasures of Tutankhamun exhibition which was shown in London at the British Museum in 1972. www.tutankhamun-exhibition.co.uk. Location: In the centre of Dorchester. Wimborne Minster, High Street, Wimborne, Dorset, BH21 1HT, Tel: 01202 884753. Ror over 1300 years this Wimborne Minster has been a centre for pilgrimage, prayer and worship. Visit the Minster and you will be warmly welcomed. In the summer Guides and 'Ministry of Welcome' are on duty. www.wimborneminster.org.uk. Location: About 3 miles west of Ferndown. Poole Quay. Poole Quay offers a bustling atmosphere, restaurants, cafes and pubs. On the lively Quayside is the Poole Pottery factory shop, and plenty of excellent places to eat and drink. Enjoy the 18th Century architecture and the cobbled streets. Building work started on the new Waterfront Museum in February 2006. About 4 miles south of Ferndown. Bournemouth International Centre, Exeter Road, Bournemouth, BH2 5BH. Telephone: 01202 456400. The Bournemouth International Centre (BIC) is one of the most prestigious venues for conferences, exhibitions, entertainment and events. From Birthday Parties to Party Political Conferences, Amateur Musicals to top Rock and Pop Concerts. 17disabled parking spaces. www.bic.co.uk. About 5 miles south of Ferndown. Ringwood Brewery, 138 CHRISTCHURCH ROAD, RINGWOOD, HAMPSHIRE, BH24 3AP. TEL: 01425 471177. Brewery Tours and sampling of our ales. After the visit you make your way to our pub in Ringwood (approx. 1 mile). www.ringwoodbrewery.co.uk. Location: About 5 miles east of Ferndown. Poole Lifeboat Station museum. Tel: 01202 665607. Pooles 19th century lifeboat station on the east end of the quay is still as it was when the last serving crew shut the door in 1974. It is now a museum. www.poolelifeboat.co.uk. Location: In the centre of Poole. Brownsea Island Ferries, Sandbanks & Poole Quay. Tel: 01929 462383. 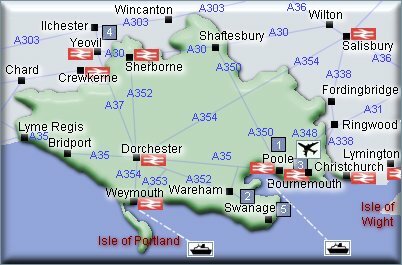 Visit Brownsea Island from Poole or Sandbanks. Bars and drinking areas on all our boats. The least expensive crossing is from Sandbanks which incidentally is the original route taken by Lord Baden Powell in 1907. www.brownseaislandferries.com. Location: In the centre of Poole. Poole Quay. Poole Quay offers a bustling atmosphere, restaurants, cafes and pubs. On the lively Quayside is the Poole Pottery factory shop, and plenty of excellent places to eat and drink. Enjoy the 18th Century architecture and the cobbled streets. Building work started on the new Waterfront Museum in February 2006. Location: In the centre of Poole. Wimborne Minster, High Street, Wimborne, Dorset, BH21 1HT, Tel: 01202 884753. Ror over 1300 years this Wimborne Minster has been a centre for pilgrimage, prayer and worship. Visit the Minster and you will be warmly welcomed. In the summer Guides and 'Ministry of Welcome' are on duty. www.wimborneminster.org.uk. About 4 miles north of Bournemouth. Portland Museum, 217 Wakeham, Portland, DT5 1HS, Dorset. Tel: 01305 821804. Archaeology, Archives, Costume and Textiles, Fine Art, Weapons and War, Science and Technology, Social History, Land Transport, Maritime. On the Isle of Portland. Portland Castle, Dorset - DT5 1AZ. Toilets: Accessible WC. Shop: Level access. Snacks available from shop. Picnics welcome in grounds. Access to castle and Captain's House. English Heritage. Charges apply. Overlooking Portland Harbour in Castleton, Isle of Portland. Nothe Fort, Weymouth, Dorset, DT4 8UF. The fort was built in 1860 to protect Portland's harbour, which was then becoming an important Royal Navy base. The fort played an important role in World War II, when the harbour was used by the British and Americans. www.fortressweymouth.co.uk. Location: About 3 miles north of Portland. Brewer's Quay, Weymouth. Tel: 01305 777622. Re-developed Victorian Brewery, in the Old Harbour now housing the award winning Time Walk and indoor Shopping Village. Admission charges apply to the Time Walk Museum. Location: About 3 miles north of Portland. Swanage Railway, Station House, Swanage, Dorset BH19 1HB. Tel: 01929 425800. The award-winning Swanage Railway currently operates on the six miles of track between Swanage and Norden, through the beautiful Isle of Purbeck, passing the magnificent ruins of Corfe Castle. www.swanagerailway.co.uk. Location: Station in the centre of Swanage (Station at Corfe Castle - below). Durlston Country Park & Marine Project, Lighthouse Road, Swanage, Dorset, BH19 2JL. Tel: 01929 424443. Durlston is a fabulous 113hectare (280acre) countryside paradise, consisting of sea-cliffs, coastal limestone downland, haymeadows, hedgerows and woodland. www.durlston.co.uk. Location: On the outskirts of Swanage. Corfe Castle, The Square, Corfe Castle, Wareham, Dorset BH20 5EZ. Tel: 01929 481294. Thousand-year-old castle rising above the Isle of Purbeck. Castle View visitor centre explores the lives (and deaths) of past residents. National Trust. Charges apply. Served by Swanage Railway (above). About 4 miles west of Swanage. Wimborne Minster, High Street, Wimborne, Dorset, BH21 1HT, Tel: 01202 884753. Ror over 1300 years this Wimborne Minster has been a centre for pilgrimage, prayer and worship. Visit the Minster and you will be warmly welcomed. In the summer Guides and 'Ministry of Welcome' are on duty. www.wimborneminster.org.uk. Location: In the centre of Wimborne Minster. Poole Quay. Poole Quay offers a bustling atmosphere, restaurants, cafes and pubs. On the lively Quayside is the Poole Pottery factory shop, and plenty of excellent places to eat and drink. Enjoy the 18th Century architecture and the cobbled streets. Building work started on the new Waterfront Museum in February 2006. About 4 miles south of Wimborne Minster. Bournemouth International Centre, Exeter Road, Bournemouth, BH2 5BH. Telephone: 01202 456400. The Bournemouth International Centre (BIC) is one of the most prestigious venues for conferences, exhibitions, entertainment and events. From Birthday Parties to Party Political Conferences, Amateur Musicals to top Rock and Pop Concerts. 17disabled parking spaces. www.bic.co.uk. About 5 miles south of Wimborne Minster.